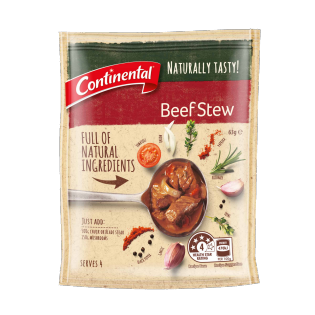 Continental Naturally Tasty Beef Stew is a recipe mix full of natural ingredients, so you can create a delicious meal the whole family will enjoy! Vegetables (39%) [onion, tomato (powder, pieces), red bell peppers], wheat flour, spices (paprika, garlic powder, pepper, caraway, nutmeg, allspice), potato starch, sea salt, sugar, corn oil, herbs (thyme, rosemary, bay leaves), lemon juice powder. Just add... 1 tablespoon sunflower oil 500g chuck or blade steak, trimmed and cubed 2 cups (150g) sliced mushrooms 1 pack Recipe Base 1½ cups (375mL) water Pasta to serve Preparation time: 10 minutes Cooking time: 1½ hours Simply… 1. Heat oil in a large saucepan and brown beef and mushrooms. 2. Add Recipe Base and water, bring to the boil stirring. 3. Cover and cook over a low heat for 1-1½ hours until meat is tender. Serve with pasta and steamed broccoli. Amazing flavours engaged in a taste fiesta even for the fussiest palate! Whole family loved it.